On Monday, October 17th, The Octant held its inaugural “Octalk”, the first in a series of college-wide discussions involving students, staff and faculty. The session focused on the question “Who Speaks for Yale-NUS?”. It aimed to address the long-standing issue of Yale-NUS College’s representation to the public, especially with regard to conflicting views of the students and staff. What emerged, however, was a different discussion surrounding identity and perception: nearly everyone agreed that the College was too often associated with the shroud of elitism, and were keen to find out why. Around twenty students attended the Octalk, including members of the Student Government, the Octant, and the student body at large. The students had mostly similar opinions: they believed that the public viewed Yale-NUS as an elitist institution. The majority felt that this sentiment was particularly strong from students of the National University of Singapore (NUS). Reasons given included Yale-NUS’s selective admissions process, the enclosed and isolated nature of the College, and issues such as the Yale-NUS Library’s restrictions towards non-Yale-NUS students. Students also expressed that the College, being a young institution, was relatively unknown amongst their peers and acquaintances. Some said that they believed the College was viewed as a “wannabe-Yale”, with relatively low recognition by the public. They found this particularly worrying as it meant the “Yale-NUS” name would not carry much legitimacy, especially when applying for jobs. 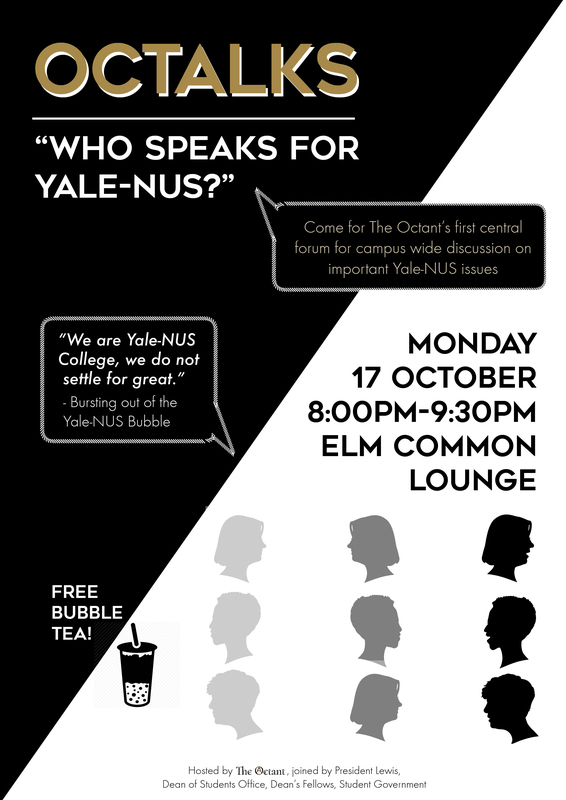 Another perspective brought up during the Octalk include the idea of Yale-NUS being seen as ‘Western’ due to its liberal connotations. Therefore, it is perceived as foreign by the Singapore public. Participants also mentioned the worry that the College is seen as a drain on resources due to the significant amount of financial support offered by both NUS and the Singaporean Government. However, there appeared to be a divide between the students and the staff and faculty regarding the issue of public perception. Overall, the staff and faculty noted receiving more positive feedback about the College. For example, representatives from Public Affairs, said that media personnel that they had interacted with were generally familiar with Yale-NUS and what it stood for. The issue of awareness, they said, was perhaps not as serious as the students might perceive it to be. They added that the media tended to focus on the College’s diversity and its innovative curriculum rather than the negative impressions that students brought up. Another theme that gradually surfaced throughout the discussion was that the students attending the talk often expressed a significant degree of self-awareness, sometimes even extending to self-deprecation. Many said that the large amount of support and opportunities provided by Yale-NUS was rare in comparison to other tertiary institutions, and caused others outside the College to question whether Yale-NUS students had done enough to make use of these opportunities. Others mentioned interactions involving both Yale-NUS and NUS students, stating that Yale-NUS students could occasionally come off as “arrogant” or “snobbish” due to an overuse of complex terminology in discussions, which could be either intentional or unintentional. Xie Yihao, ’17, also said he felt that students from his generation sometimes took things for granted, which could further play into the negative perception about Yale-NUS given the resources that its students have access to. Francesca Maviglia, ‘18, also challenged the Yale-NUS community to consider whether they were being elitist through the very act of downplaying the label of elitism as misjudgement, or a largely external issue. She said that she found it troubling to start a conversation on misjudgement based on the premise that others were misguided in doing so, thus focusing the discussion on the “mistake” rather than the community’s own behaviour, and how that may contribute to the creation of the label. She also found it problematic that the public was being treated as a mass of people, which resulted in a generalisation of their opinions. Yale-NUS College President Pericles Lewis said that it was “important to distinguish between being ‘elite’ and ‘elitist’”. He said that even by virtue of the five percent admissions rate alone, Yale-NUS is an elite institution; however, that would not by itself make the College elitist, as the latter term connotes exclusive behavior. He therefore encouraged students to always be mindful of their attitudes in all interactions, and to constantly exercise humility. Ms. Fiona Soh from Public Affairs also advised students to combat any negative perceptions of the College by giving back to the community; she referred to the example of Warren Buffet, who is known more for his legacy and charity rather than his wealth. The Octant plans to continue the Octalks series next semester and will make announcements accordingly.